My first memories of Xabungle are a little fuzzy. I remember going to a fall fair when I was younger, and they always had a table full of toys. 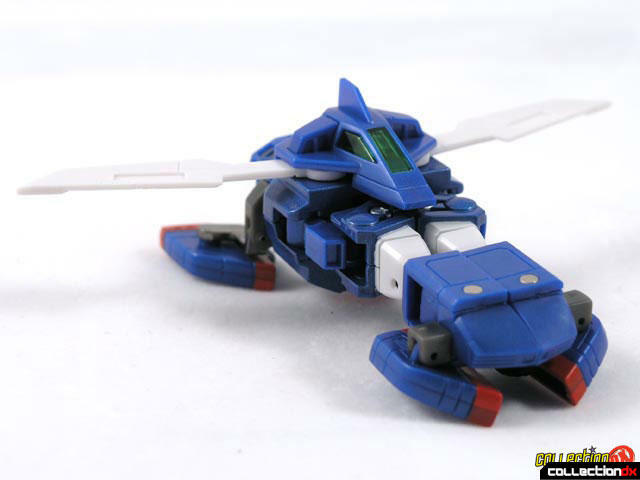 I remember lots of bootleg Machinerobo toys, Orguss toys, and then there was this blue guy. I skipped over him in favor of a bootleg space shuttle Machinerobo, but I didn't forget him. A few years later, I would run into him again, this time on a blister card at a drugstore. I wouldn't learn his true identity until I became an adult collector. The character was called Xabungle, from the series Blue Gale Xabungle. The character was designed by Kunio Ohkawara, who also designed mecha from Gundam, Votoms and Dougram. The series was created and directed by Yoshiyuki Tomino as a follow up to his hugely influential Mobile Suit Gundam. 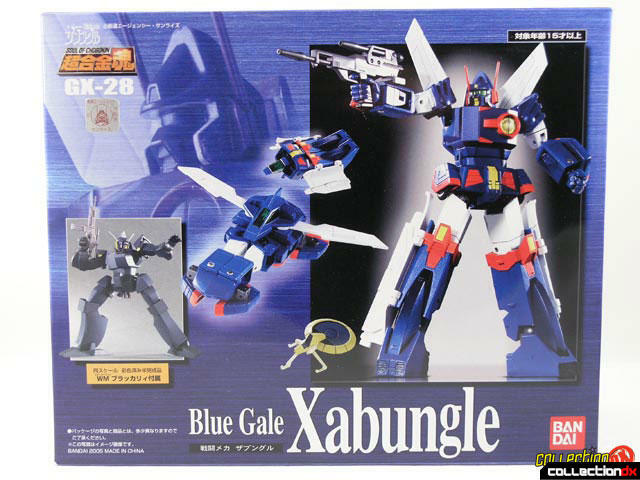 Blue Gale Xabungle ran 50 episodes from 1982 to 1983. 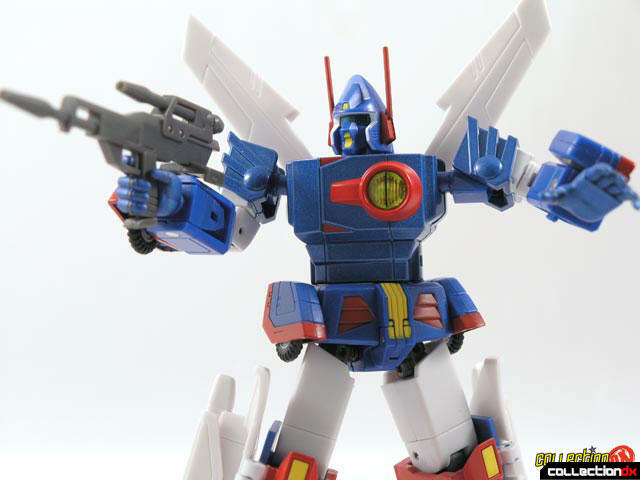 There have been many Xabungle toys over the years, from the cheap train station toys, to the classic DX Clover sets, but none has ever attempted to be both anime accurate AND transforming. 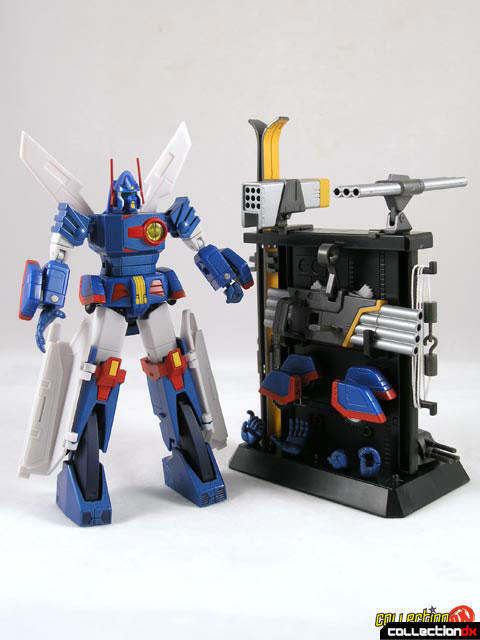 Enter the Bandai Soul of Chogokin Xabungle. 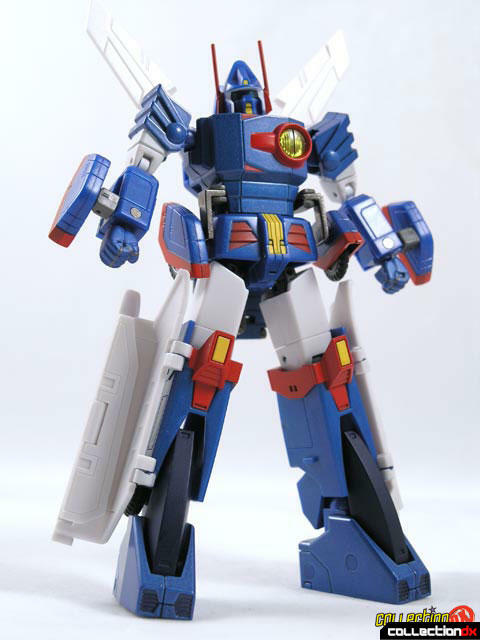 Released in October 2005, the SOC Xabungle attempts to be both an anime accurate toy and a transformable robot. That's a lot of parts. All the parts fit onto the display stand, which has no nameplate. The fists do not fit snugly onto the stand, and have a tendency to fall off with the slightest touch. The Xabungle toy is about 6 inches tall, and made out of ABS plastic and good old fashioned die-cast metal. The metal content is in the shoulders, chest and feet, but it is enough that it gives the toy a good solid feel. Articulation is excellent, but make sure you pull the feet down so both the lower leg and foot snap into place to get the full range of motion. The styling of this toy fits in perfectly with the old HCM Galliar, so much so that you feel that this toy could have been made back in the day. They are even in the same scale! 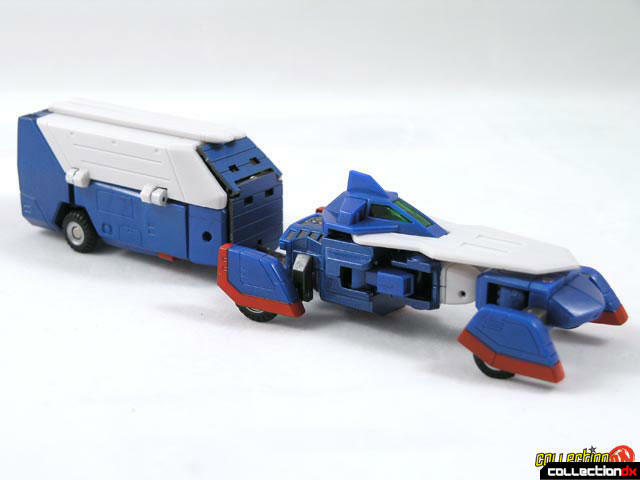 Xabungle transforms just like it does in the show, but it requires special parts to do so. Because the parts are a bit bulky for normal play, Bandai provided and additional set of anime accurate wheels for display. First, Xabungle splits in half and becomes 2 vehicles. 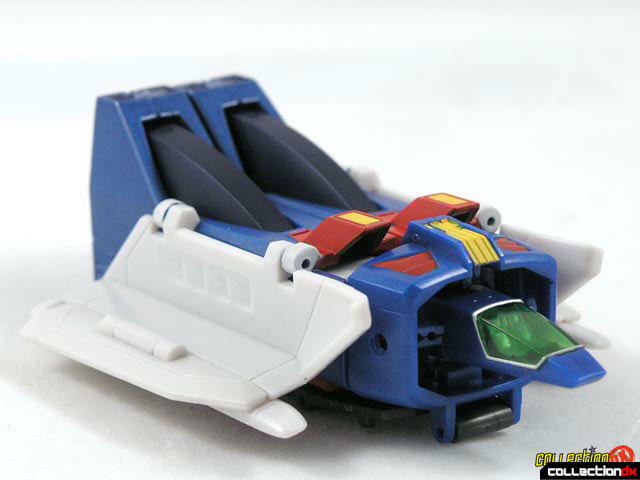 The front part of the vehicle is called the Bungle Skipper, and is comprised of the chest and arm sections. To transform it you have to remove the torso of Xabungle from the lower half, and push the head down into the chest cavity. You have to be careful to not damage or loose the antenna here, but just in case, Bandai provided 2 extra sets. Swing the arms up over the head, and then rotate the hand assembly around to reveal the nose sections. That's all there is to the transformation to Bungle Skipper. You can also change Bungle Skipper to flight mode. The bottom half of Xabungle becomes the Bungle Rover trailer. Simply collapse the legs, close the covers and seal up the front with the armor plate. A small hook attaches the Bungle Rover to the Bungle Skipper for a combined cab and trailer mode. Bungle Skipper also has a flight mode, simply by unfolding the white covers. 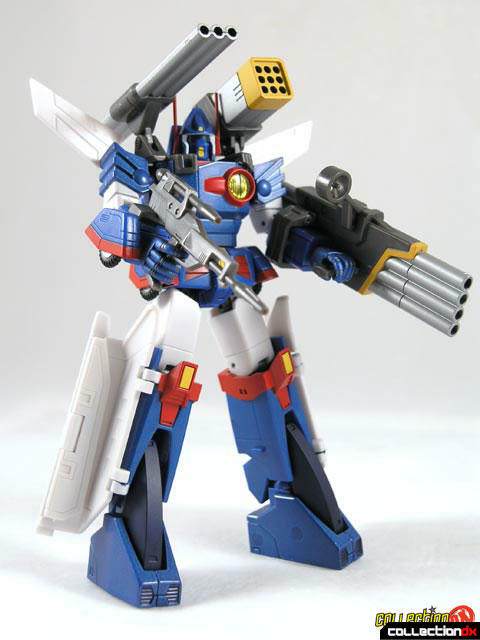 Xabungle can hold a variety of weapons. Use the trigger hand to hold the rifle or arm mounted bazooka. The bazooka has a switchable trigger grip so that it can be used on either arm. The shoulder mounted launchers do not like to stay attached to the toy at all. The one on the right shoulder is more secure than the left on my toy, but I have heard conflicting reports. Some owners have no problems at all, some fall off with the slightest touch. 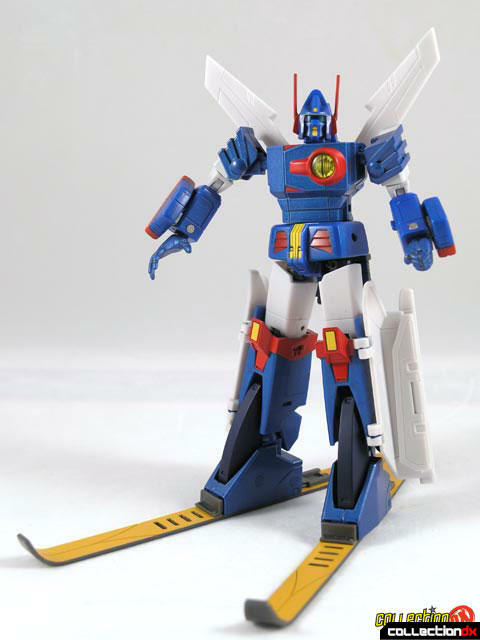 You can also hold a tank turret, and even attach Sand Skis to Xabungle's Feet. Xabungle may not be the biggest SOC, but you can do a lot with it. Xabungle has a few minor flaws, but it's not too bad. First is the issue with the antenna - they are much too fragile and are prone to popping off. Sure, Bandai gave you replacements, but that's like they are admitting it is a problem instead of solving it. 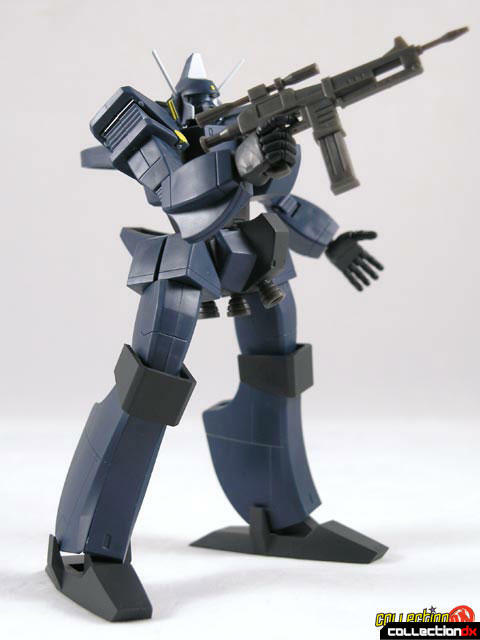 Second, the shoulder launchers don't like to stay on. The backpack assembly des not like to stay attached unless you really press it in hard. Finally - the stand kind of stinks. Nothing is really secured to it well, and there is no nameplate. Included with the Xabungle is a model kit for the long lost Brocakry. This is no ordinary kit though. It's just fantastic; so much so, that it deserves its own review.. I hate this toy. For, even the slightest touch will break this toy. And for something that is over 100 dollars that is ridiculous! Pieces fall off. Parts that you need break. A waste of my time. The model kit that is included with this is better. As the pieces stay on better. Honestly, this is the worst toy I have ever dealt with!